If Clive Hart isn't going to welcome the news that Air Sea Rescue services will once again be operating from Manston airport, let me be the first to welcome them home instead. 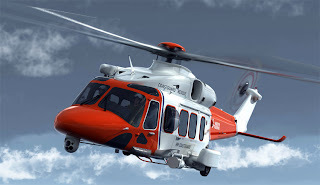 What was once the British company, Bristow, was bought by a US business some years ago but it has now been awarded the contract to replace both the RAF and Royal Navy's ageing fleet of helicopters, with a privatised service operating the latest models. Manston will be one of its rescue hubs and this is great news for the airport, both in terms of new jobs and potentially, tourism too, as people will come to see the latest helicopters while they have novelty value. The service will operate a mixed fleet of 22 state-of-the-art helicopters from ten locations around the UK. AW189 helicopters will operate from Lee on Solent, Prestwick airport, and new bases at St Athan, Inverness and Manston airports. Whether Clive is worried about night rescues breaking his delicate airport curfew or shattering the calm of Ramsgate in the early hours I don't know but in case you need to be reminded, there's a County Council election next month and so perhaps there's a reason there? Last night's cabinet meeting saw the launch of the Council's much vaunted diversity and discrimination policy. The good news is that Cllr Worrow's earlier plans for 'Diversity blog wardens' are not included but he did find the time to deliver a rambling and emotional speech on his experiences of personal discrimination, where he claimed to have consulted extensively with local residents and faith groups over the content. This caused me to turn to Cllr Tom King behind me with a raised eyebrow. "Tom, have we had any consultation of this kind in Westgate?" "No!" "Thought not." Out of personal interest. If you have been part of this "extensive local consultation", by the Council's 'hard-working' diversity champion as either part of a community or a faith group, do please let me know, as I'm rather alarmed that Westgate appears to have been left out or may even be the subject of discrimination? Changing the subject completely, the campaign to object to a Tesco in Westgate continues and I met with a small committee this week at the home of Ted Wolf. There is now a new petition to sign at Edwards Store and several letters from concerned local groups appear in the Thanet Gazette this morning. A longer and more detailed collective objection, has been sent to all the members of the Council's planning committee, offering new arguments on why members of the public opposed to the development, believe they should reject the application. Next Friday, 5th April at 09:30, there is a site visit by members of the planning committee at Station Road in Westgate. This will coincide with a silent public demonstration which will assemble at just after 09:00, for those who wish to express their opposition in numbers. What we don't want, of course, is the planning committee to abandon the visit over concerns of heckling and personal safety, as this would be entirely self defeating. So if you do plan to attend I would ask you to help me to remind everyone else that silent opposition and protest will achieve very much more than noisy protest at this very delicate stage of the application, which comes back to the committee for final decision on Wednesday April 17th at 7pm. Simon, just to show that you're not completely biased, can you or one of your readers tell us where the "FOR Tesco" petition is? The Gazette reported that it had received very few signatures but maybe that's because no-one knows where it is! I have no idea I'm afraid.. I'm representing the objectors and nobody has approached me with a view to forming a pressure group in favour of the application. Re Tesco Westgate. Reading about all the planning hurdles mentioned in letters in the IOTG it would appear that this is a subjective test as to the effect on a conservation area of the proposed construction. Clearly, in the eyes of the correspondents, the proposed design is totally out of keeping with the area. (I have not seen the plans). If these correspondents are right in their opinion, why then does Tesco not withdraw from the application, or do they know something that the rest of us are not privy to? I think the 'Fors' for Tescos are the silent majority of Westgate residents and not the minority 'against' non Westgate residents. Re anon at 11:28. The squeaky wheel gets the oil. I'd like to sign the petition against Tesco - where is Edwards please? I drove through Westgate today and couldn't find it. Many thanks. That big purple shop? Ok thanks. I wonder why it doesn't have a name. Is there a petition against Edwards? What are the veiws of Tom King & Jodie Hibert are they for or agaist Tesco's?? Is Cllr King sitting on the fence? @ Anon 11:28 We don't know how many "Fors" there are because they failed to get together to produce a petition. As we don't know how many there are it's hardly fair to call them the majority. It would appear that you are "for" the Tesco Metro, maybe next time you should do something about an issue you care about... then at least you can whinge and have a valid reason. Tom King can't comment as a member of the planning committee and I'm sure Jodie can comment for herself should she wish to. I have no idea of her position and so it seems does nobody else! Well Rob according to last week's Gazette there IS a "for" petition, but very few have signed it. So, where is it? It is not for me to comment on the Westgate Tesco bearing in mind that I live in Ramsgate. Mine is a general question about privately owned shops and the supermarkets. When your commuters get off the train in the evening are the any shops open nearby the station where they can buy some essentials say to take home to eat? These days I daresay there are. For the record, I once worked for Tesco albeit briefly. They are in my experience a bunch of bullies and I do not shed a tear when they fail. They are going to do a bookshop. Second hand as well. To be run by a blogger. Locally grown solvent and lead waste enhanced cauliflowers. And a complete ban on scaremongering. It is the 15th Anniversary of Good Friday Agreement. Re Cllr. Worrow and consultation. I observed him in Birchington just before Christmas, wandering up and down Station Road. Seemed to spend most of the time on his mobile. Don't know if this was part of the consultation process? I do not understand your comment. Still, I supose it makes sense to you. John Holyer, just to put your mind at rest, the incoherent anonymous comment is from Rick. The anniversary of the Good Friday agreement is a dead giveaway and he would, normally, from there go on to the Deal bombing, but knows Simon would not publish it. As long as you accept his comments do not make sense they can make informative reading into the inner recesses of the mind of a conspiracy theorist. 2:27 Worrow in Birchington, what a surprise! must have got lost, no we have not been part of his "consultation", in fact I understad even his grandstanding at Parish Council did not include his achievements on diversity, as if anyone reallycares any way. The day a certain councillor answers my emails will be a diversity celebration and equality day.